Coast - panoramic views from large spacious home. 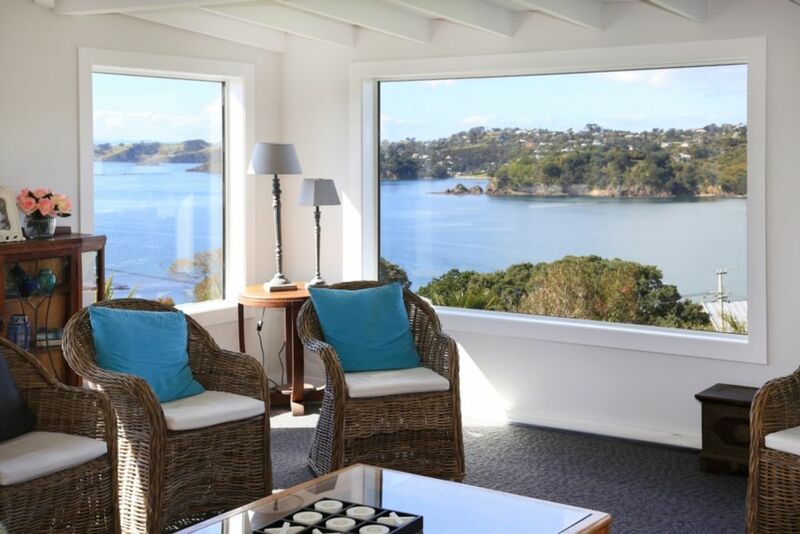 “Coast” – Enjoy this wonderful peaceful Waiheke Island home. It is a great place to relax and enjoy all that Waiheke offers. With panoramic coastal views – over Oneroa Bay, along the northern shores of Waiheke Island, to Hauraki Gulf to Coromandel Peninsula, the vineyards around Peninsula Estate and even to Maraetai in Auckland City. It is a very short walk to Oneroa Village, Resturants, Beach, shops, cinema, public library Waiheke’s much loved Artworks Gallery Music museam and bus stop. Also handy location to most wedding venues, including Mudbrick, Cable Bay. #3 bedrooms, 3 bathrooms with large living room and connecting study. NOTE: while we say 6 person max, we can cater for more as there is a additional single bed in bedroom 3 and there is a portacot for a baby available. There are a wide variety of walking trails nearby and the downtown ferry is only a 10 minute walk away. Mudbrick and Cable Bay restaurants are within 5 minutes driving. Rate covers up to 6adults - $70 per additional person. Easter weekend and Labour weekend will be charged at high season rate. Weekend bookings usually only taken for 2 consecutive nights. During summer holiday prime time minimum booking of 7 nights may apply. There is a linen fee of $25 per head(premium hotel quality bed linen) and a $60 cleaning/service fee. Great location, thoroughly enjoyed our stay. Highly recommend. Wonderful place, wonderful views, great location. Can’t fault it, and can’t wait to come back. A really great place to enjoy the delights of Waiheke. Oneroa beach is a short (if steep) walk, and the village and art centre are very close. Everything is furnished beautifully and very comfortable. Great property. Lots of room and amazing views. Highly recommend. Beautiful views, amazing property well looked after and everything you need in the house. Great location- easy to walk down to shops and beach. Amazing bach - gorgeous views! Well stocked and only a short walk into Oneroa town.